The Dubai Autodrome was opened in October 2004 as part of the Union Properties Motorcity development, which will eventually have a number of motor facilities and apartment buildings (where residents will be saying "What?" a lot, unless they have double glazing). The Autodrome has an FIA approved track which is 5.39 km in length, as well as a CIK approved karting track, and no policemen with radar traps to catch you speeding. There's a Race & Driving School where you can spend a few hundred dhs for a speed rush which won't get you into trouble with the authorities. The FIA track should be good for Formula 1 races but it's F1 in Abu Dhabi from 2009-2016. Bad luck Dubai. Grandstand capacity is about 7000 spectators which sounds a bit low if Dubai was hoping to host an F1 event, but there are plenty of picnic areas around the track. Despite Formula 1 Grand Prix not coming to town, there are many other motor racing events held at the Dubai Autodrome, some with free entry for the cheap seats (the champagne and salmon sandwiches section will cost a bit more). It's also possible to take your own car or motorcycle for a punt on one of their track days or track nights. Just try not to stack it up against a wall - it's unlikely your friendly car insurance company will cover you. To get to the Dubai Autodrome, head into the desert at interchange 4 on Sheikh Zayed Road (up Al Qudra Road or Umm Suqiem Rd - same road, different names), turn right at the Arabian Ranches interchange towards Motorcity and you'll see it on your right a short while later. The Dubai Autodrome instructors will take you for a drive around a race track in one of several different race cars (Audis, Subaru Imprezas) and then you can have a go yourself. It'll cost you between 200 and 1000 dhs depending on what you choose. You can also arrange corporate packages with the whole team going for a pleasant drive through the countryside. It is possible to take your bicycle around the Dubai Autodrome track. It will take a little bit longer than if you're in one of the race cars but you'll use less petrol. From August 2010, cycling can be done on Friday mornings. Update: in 2011, cycling evenings are on Wednesdays from 1800-2100 - just turn up, drive around the back of the autodrome circuit to the central car park, and pedal onto the track from there. Contact the Dubai Autodrome for more details of cycle events. Or Cycle Safe Dubai? 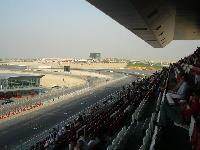 Cycling in Dubai has more information about cycling at Dubai Autodrom and other places. 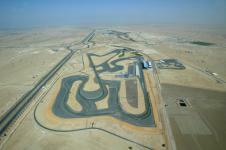 Dubai Autodrome tel +971-4-3678700 for general enquiries, or tel +971-4-3678745 for the race and drive center. 09-10 Jan 2009 - Dubai 24hr endurance - 24 hour touring car endurance race 2009. 30 Jan 2009 - National Race Day 4. 27-28 Feb 2009 - Speedcar National Race Day 5. 20 Mar 2009 - National Race Day 6. 10 Apr 2009 - National Race Day 7. 24 Apr 2009 - National Race Day 8, Grand Finals. 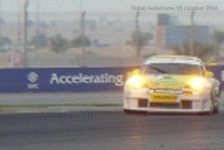 www.dubaifaqs.com/dubai-autodrome.php (PDF and print version).